Aluminum Foil Pie Pans are effective for cooking and heating food. Some restaurants use them for baking pies while others use them for bread. Bakeries use aluminum pie pans to cook bread and pastries in. Many fine dining restaurants use the round foil pans for quiches. Foil pans are disposable and a necessary restaurant supply. 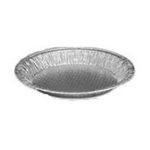 Handi Foil Extra Deep Pie Pan - 9 in. Handi Foil Quilted Bottom Pie Pan - 10 in. Vollrath Wear-Ever Aluminum Pie Pan - 10 in. x 8 in. x 1 in. Restaurant and bakery pie pans are used throughout the world to make great tasting pastries and desserts. We have been selling pie pans across the United States for over 40 years.